These sketches are character designs for our Character Portrait assignment. We decided to use basic silhouettes to portray our characters. 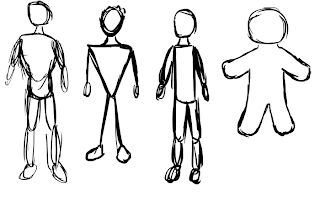 At first I tried making realistic silhouettes, but we decided to take advantage of the fact that we’re working in animation and make more stylized, cartoon-y characters. I tried a lot of different shapes to get her design down - the 4th one is based on a flower, for example. My personal favourites are number 1, 3, and and 6. Ultimately we decided to use number 3, but with a slightly longer dress and longer hair. I found the male form harder to draw. 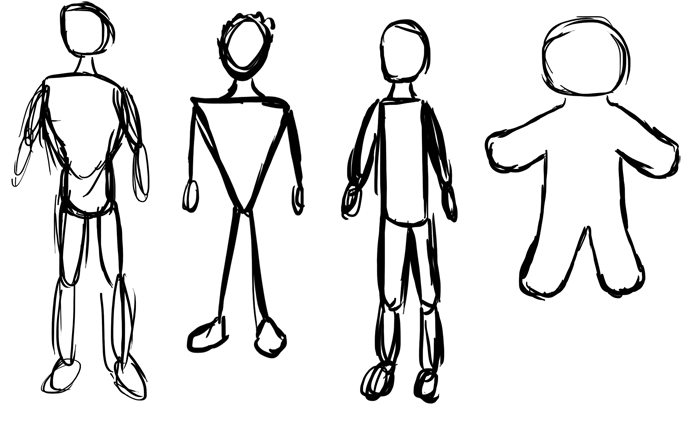 I always find males harder to draw, and stylizing them just makes it worse. We’re going to go with something close to number 3. A motion study of the main character for our Character Portrait assignment. I animated her in Flash. 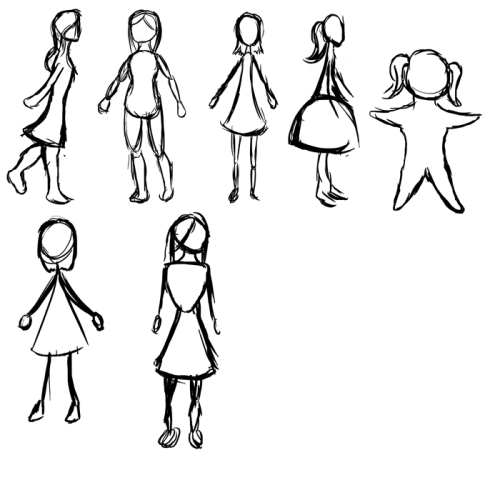 The animation is smooth, but I think I to adjust her stride a bit so her steps aren’t as long. She seems to be strutting her stuff here, which isn’t exactly the look I was going for. As we are working in silhouettes Lisa was charged with creating the form of both a male and female lead that reflects the characters cultural background: Chinese. As well as the color palette. The original backgrounds were going to be tea-stained, with accenting colours matching that ofthe Chinese and Canadian flags. 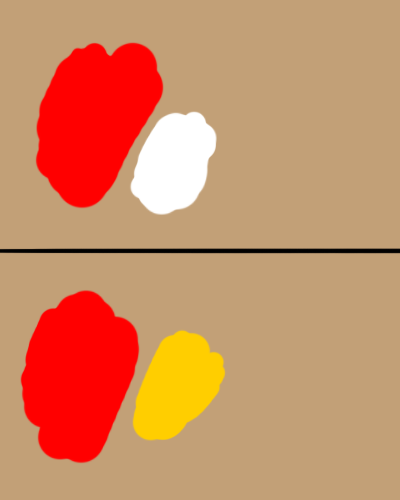 Hence red and white, and red and gold. The colours below were taken direct from country flags. 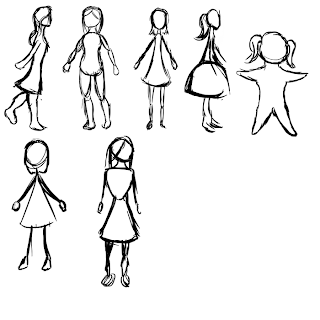 Lisa's first take on the silhouettes was to draw them realistically. This may have been a reflection on The Lost Kiss video that I produced earlier in the year which inspired the group's desire to use silhouettes. 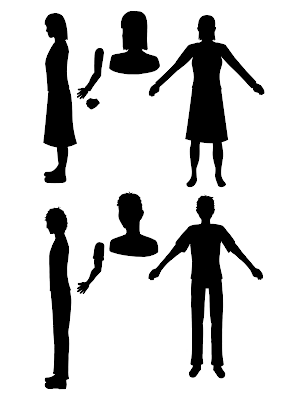 However, as an animation project it did not seem appropriate to try to reenact a human's movement and mannerisms (The Lost Kiss was filmed with a green screen), nor did a realistic representation that was not the actual silhouette of our interviewee seem appropriate. 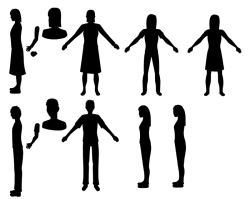 Instead, to reflect the uplifting tone of the interview Lisa was asked to create the silhouette in a more universal representation of a girl and a guy that reflected Asian lineage. The second character designs reflected the universal female image mainly due to the use of skirts. The first sketch was hard to understand the overall appearnce due to the side angle. The second lacked a skirt. The fourth sketch was excluded due to the Victorian nature, and the fifth due to the childish nature and body-shape of the starfish. The seventh still reflected too close to realism. We decided that the 3rd and 6th sketches were the closest images that matched the animation concept we wished to reflect from the interview. 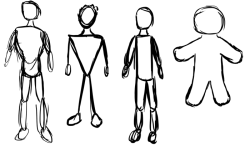 The third character sketch here is the closest match to the 3rd and 6th character sketches of the main female character above. We were still designing the character when the motion test was due so Lisa had to decide to draw a temporary figure for the motion test or finalize the character first. She chose to use a temporary female image and then not alter the character design. The motion test went well, and had a decent amount of frames. Lisa did not continue to use that amount of frames for the final animation. There were two instances that led me to push Lisa to complete the character design even after she had started animating without the go-ahead. One was when an Asian friend watched the animated clips and thought the silhouette represented myself - a tall, skinny white girl - then didn't believe me when I said she was Asian. The other was a comment during our roughcut review that suggested the silhouettes could be more defined. I agreed with both these points: that the silhouette should feel Asain (or at least be an anonymous silhouette), and that the detail in the shape of our character was lacking. To assist her understanding of how abstracted silhouettes can be detailed without being realistic I sent her this clip, suggesting to watch around 2:50 to demonstrate how each line identifies the shape, with a caution that the skeletal style they are using here is not what we are after. 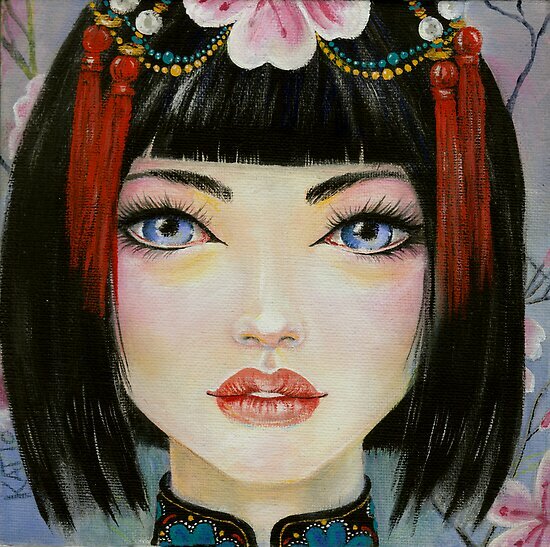 We want a female that is short and Asian.